Lot # 372: 1972 O-Pee-Chee #49 Willie Mays (PSA Gem Mint 10) - The SOLE PSA Gem Mint 10 Example! 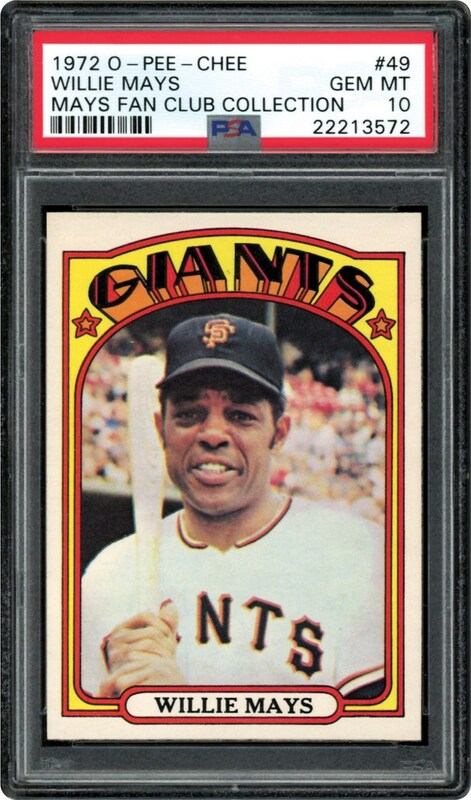 1972 O-Pee-Chee #49 Willie Mays (PSA Gem Mint 10) - The SOLE PSA Gem Mint 10 Example! After 20 remarkable seasons with the Giants franchise, the immortal Willie Mays would finally change jerseys during the early part of the 1972 season. The legendary 41-year old centerfielder would be traded to the New York Mets and in his first game with his new club, he would belt a game-winning homer at Shea Stadium ironically against his former San Francisco Giants squad. 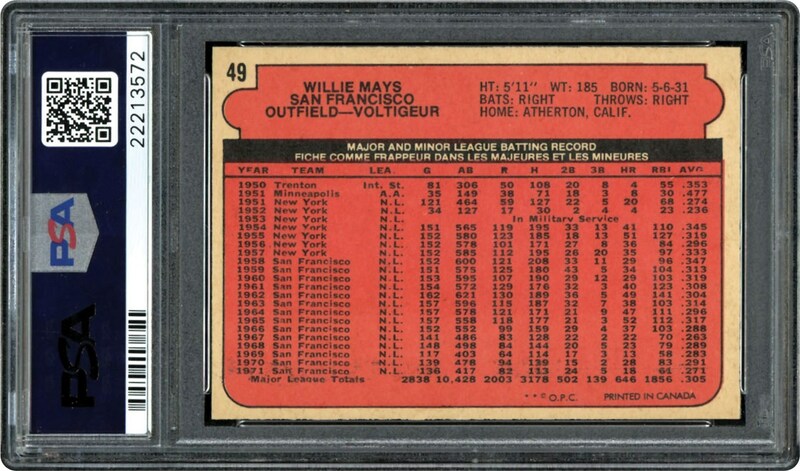 Indeed, the "Say Hey Kid" had returned home to New York with a "bang", similar to the unfathomable aesthetics of this "one of a kind" PSA Gem Mint 10 1972 O-Pee-Chee Mays offering that stands alone at the top of the illustrious PSA "Pop" Chart! Its "best of the rest" assessment is merited by the irrefutable pristine technical attributes including a captivating portrait pose, atypical near-perfect centering (with most 1972 cards depicting skewed images), blistering sharp corner tips, blinding white borders and impeccable surfaces. A perfect testament to the "Say Hey Kids'" unbridled legacy, its unique standing as the SOLE PSA Gem Mint 10 specimen is truly synonymous with Willie Mays arguable status as baseball's greatest all-time centerfielder!